Plastic Bin: plastic and glass drink pitchers. Basket: plastic drink cups for travel and refill cups for our local theme park. Second shelf on the Right Shelf. The second shelf holds wash tubs that I purchased from Walmart for $1 a piece. They are great for holding oversized things that don’t fit well within the lidded storage containers. 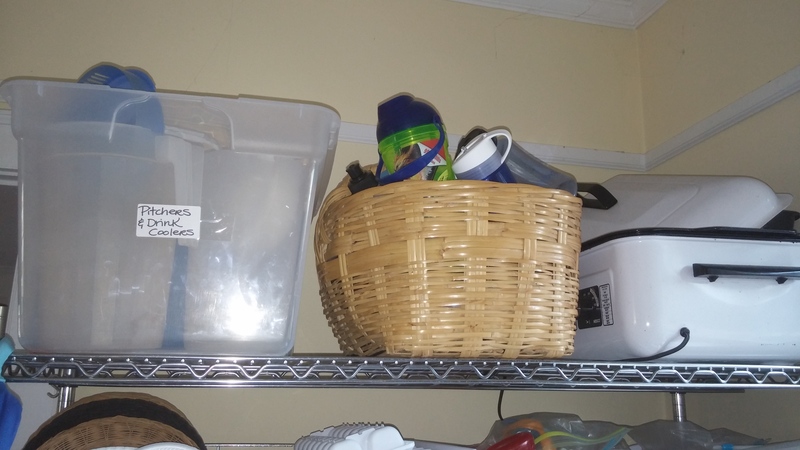 Bin 1: Paper Plates…….I also keep paper plates, paper plate baskets, Styrofoam bowls, and party plates in there. 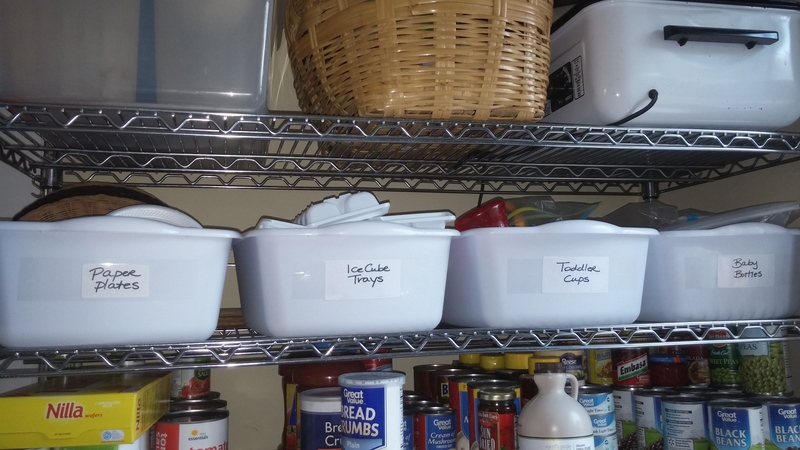 Bin 2: Ice Cube Trays……and not for ice, either. I make a lot of things that I freeze in ice cube trays, and then crack the cubes into a freezer bag and freeze……such as Vegan Chickeny Bouillon and homemade baby food. Bin 4: Baby Bottles…….Cocoa Bean was just weaned from the bottle, but as foster parents, we could get a call for a baby at a moments notice. Bottles and extra formula are staples in our house! Third shelf on the Right Shelf. TOMATOES: (6) 28oz cans of diced tomatoes, (6) 28oz cans of petite diced tomatoes, (6) 28oz cans of tomato sauce, (6) 28oz cans of crushed tomatoes, (6) small cans of tomato sauce, (6) small cans of tomato paste, (1) jar of sundried tomatoes, and (2) large jars of pasta sauce. SOUPS: I do not serve premade soups, but I do cook with a few soups. I keep (4) small cans of cream of mushroom, (4) small cans of cream of chicken, (2) large cans of cream of mushroom, (2) large cans of cream of chicken, (1) can of cheddar cheese soup, and (1) can of cream of celery. BEANS and PEAS: (8) cans of black beans, (8) cans of pinto beans, (2) large cans of bake beans, and (2) cans of green peas. (4) large containers of honey (we bake our own bread). (2) large containers of bread crumbs. (6) cans of baby clams. (3) cans of green enchilada sauce. (2) small cans of chilies in adobo sauce. (1) large jar of pure maple syrup (for recipes). Fourth shelf on the Right Shelf. BABY PRODUCTS: When there is a bottle-fed baby in the house, we keep (8) cans of formula on hand. If not, then we keep a variety of different formulas to make sure that we have something a new baby could drink……in the event of a sudden baby placement. We also keep a variety of baby cereals, and finger food puffs. JAMS & PEANUT BUTTER: (2) jars of natural peanut butter, (4) jars of creamy peanut butter, (1) jar of Nutella, (2) jars of grape jam, (1) jar of strawberry preserves. FRUITS: (6) cans of peaches, (6) cans of pears, (6) cans of pineapple, (4) cans of fried apples, (4) cans of pumpkin, (2) containers of raisins, (1) bag of dried banana chips, (1) bulk cans of peaches, (1) bulk can of unsweetened apple sauce, and (2) jars of unsweetened applesauce. DRINKS: (2) orange juice, (2) apple juice, (2) grape juice, (3) containers of Gatorade mixes, and (2) large containers of Kool-aid mix. (2) bulk cans of green beans. (1) bulk jar of hot sauce. (1) bulk container of Hershey’s syrup. (1) bulk jar of salsa. Fifth shelf of the Right Shelf. 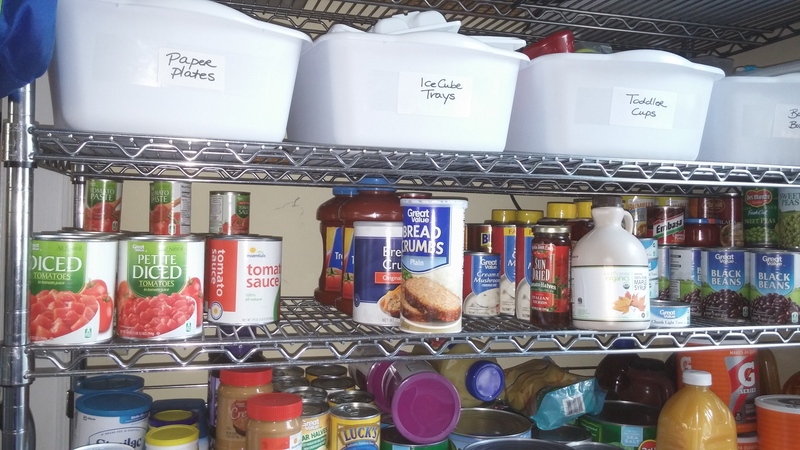 I keep a lot of the pre-made foods to make the guys lunches on this shelf, among other things. Bin 2: Cliff energy bars. 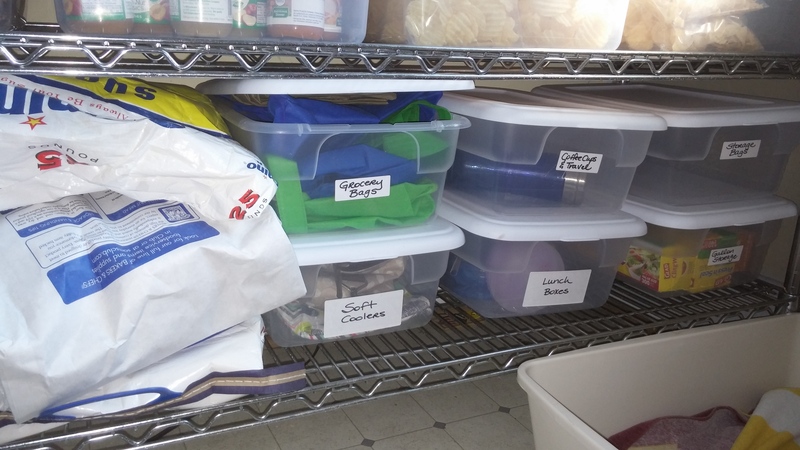 Bin 4: Boxed and bagged foods……things like tortillas, taco shells, and rice dishes are kept here. Bin 5: Jar baby foods……which we use when we are out and about, otherwise we serve our babies homemade baby food. Bin 6: Tortilla chips and pretzels……..we don’t buy the little ‘lunch-sized’ chip bags…….instead, we buy the family size bags and put individual portions into snack bags. Bin 7: Chips……the same individual portion bags that we make up ourselves. Sixth shelf of the Right Shelf. (1) large bulk size flour bag. (2) large bulk size sugar bags. Bin 1: fabric grocery bags. Bin 2: Soft coolers (from 31 bags)…….I take these for snacks, baby bottles, etc. when we go out on field trips and errands. Bin 3: Coffee travel mugs. Bin 5: storage bags……..gallon and pint size. 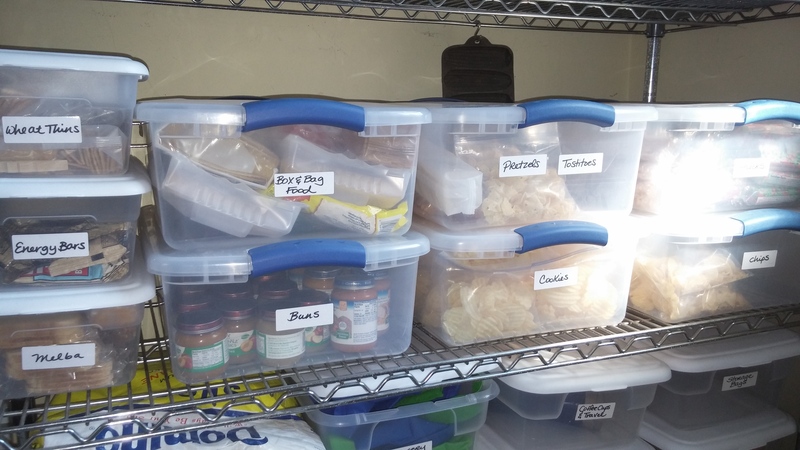 Bin 6: storage bags…….snack, sandwich, and bread size. 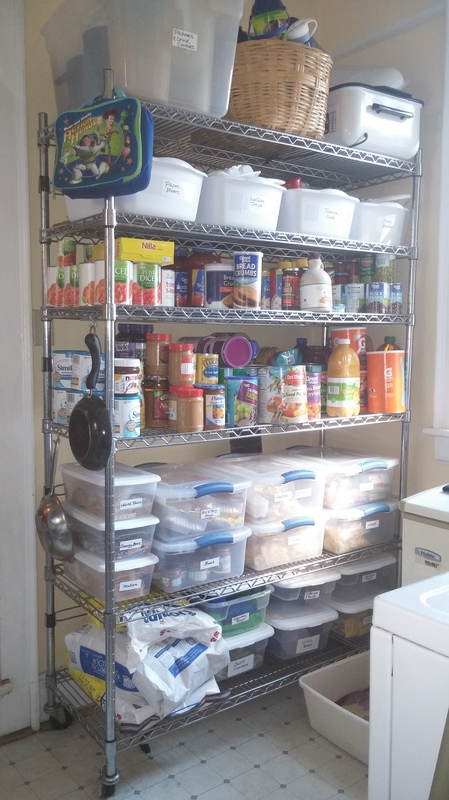 Next up, I will cover the dry goods shelf…….happy organizing! Love that you are a Thirty One customer! I am a consultant and enjoy this faith based company! 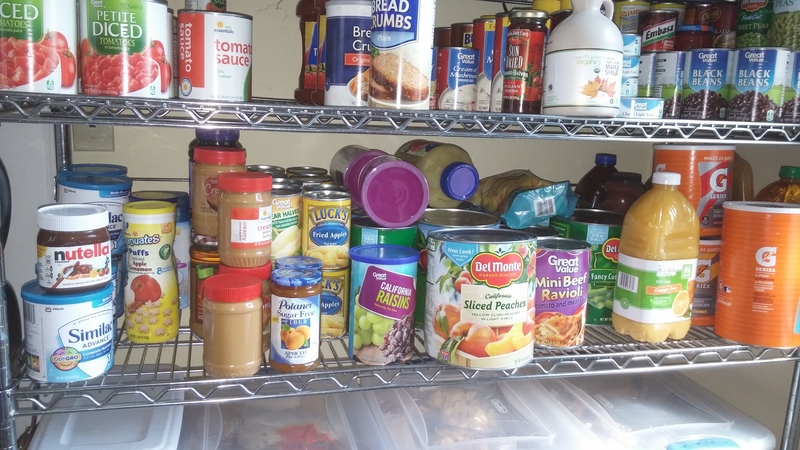 I wish I had a pantry! Maybe someday we’ll build a garage and I can be as organized as you!!! Hi there!! Are you blogging somewhere else now? I’ve missed your posts. Still here…..just a crazy life lately!